French lighting designer Benoit Deseille and artist Benedetto Bufalino’s aquarium is probably one of the craziest phone booth transformations we’ve seen! As phone booths become less and less useful individuals and organizations have converted the outdated communication systems into everything from libraries to wifi hotspots. This particular renovated phone booth was installed in Lyon, France as part of the city’s annual Festival of Light, during which locals place candles along the outsides of all the windows in gratitude to Mother Mary for allegedly sparing the city from plague in 1643. 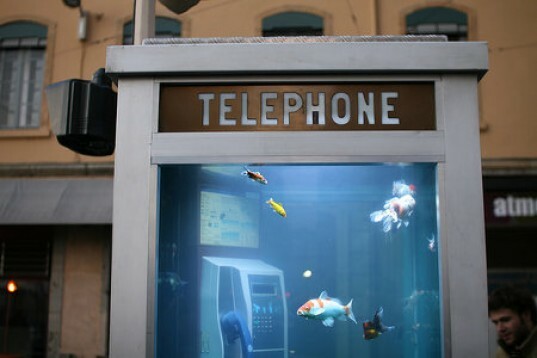 The phone booth aquarium has been described as a “fantastically creative” way to transform disused infrastructure into an everyday source of wonder and beauty. The installation has proven incredibly popular in Lyon and drawn massive crowds as they watch the fish interact with the outdated phone system. Of course, the phone booth has been sealed so that the water doesn’t leak and nobody opens it by accident. It is not the first time that phone booths have been turned into something eye-catching. In New York City, several were turned into mini libraries! French lighting designer Benoit Deseille and artist Benedetto Bufalino's aquarium is probably one of the craziest phone booth transformations we've seen! As phone booths become less and less useful individuals and organizations have converted the outdated communication systems into everything from libraries to wifi hotspots. This particular renovated phone booth was installed in Lyon, France as part of the city's annual Festival of Light, during which locals place candles along the outsides of all the windows in gratitude to Mother Mary for allegedly sparing the city from plague in 1643.